Maze & Vale is a range of organic and sustainable cloth, screen printed by designer Leslie Keating. Leslie's work is available exclusively, online and instore, at Fibresmith, a beautiful new space for quality cloth and yarn in Melbourne's Inner West. Visit Fibresmith at 14 Wembley Ave, Yarraville (opening August 2017) or online at www.fibresmith.com.au. A graphic designer with an intense love of fabric... it was only logical that someday I would start designing my own. 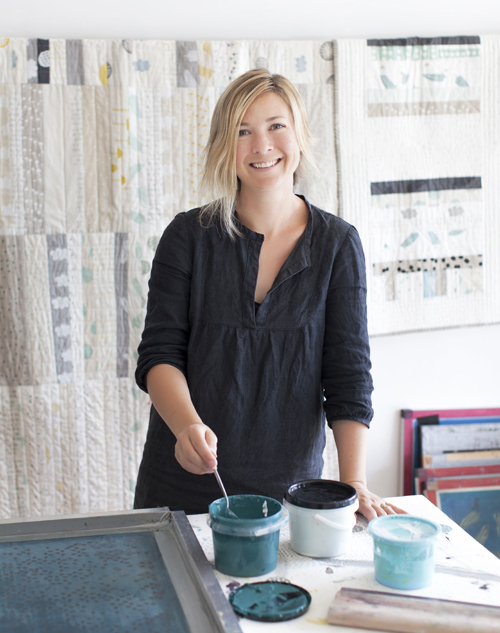 In November 2011, I decided to follow my love of hand printing and launched Maze & Vale, my thoughtfully designed range of screen printed, original design fabric. Designs are originally created as sketches or hand carved block prints and become screen prints that I pull by hand in my small West Melbourne studio. All colours are intuitively custom mixed by my own hands using environmentally friendly, water based textile inks and are printed on natural, sustainable fibres of hemp, organic cotton and linen. All designs, base cloths and ink colours are produced in small runs and are not guaranteed to be printed again.